A few clouds. Low around 55F. Winds light and variable..
BEA AHBECK/NEWS-SENTINEL Darcy Perlot, administrator, Michael Collins, owner and director, Spencer Herendeen, funeral director, and Michael W. Tansley, funeral service specialist, at the renamed Donahue Funeral Home, now Collins Funeral Home, in Lodi Tuesday, July 17, 2018. 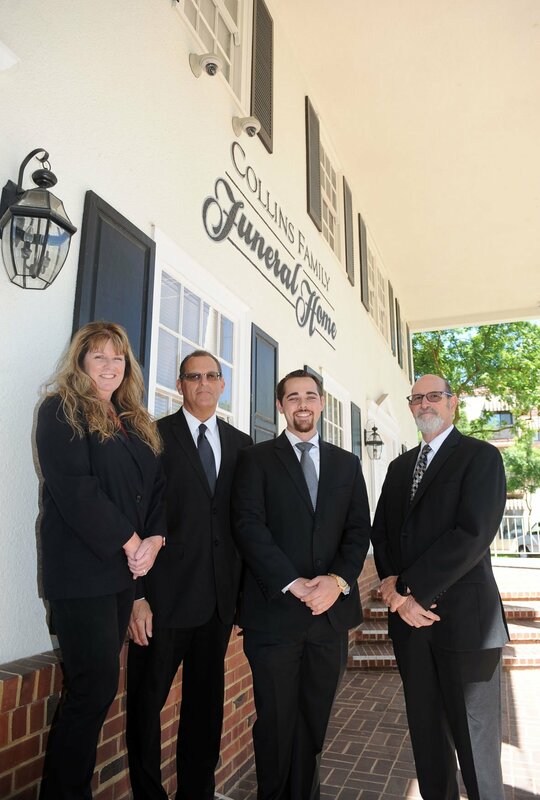 BEA AHBECK/NEWS-SENTINELMichael Collins, owner and director, Darcy Perlot, administrator, Spencer Herendeen, funeral director, and Michael W. Tansley, funeral service specialist, at the renamed Donahue Funeral Home, now Collins Funeral Home, in Lodi Tuesday, July 17, 2018. Donahue Funeral Home, serving Lodi since 1907, has come under new ownership. Last year, Michael Collins purchased the business after working at the Lodi Funeral Home for 17 years and it will be renamed to Collins’ Funeral Home in the coming weeks. Collins brought with him two other funeral directors from Lodi Funeral Home, Spencer Herendeen and Mike Tansley, who are both Lodi natives. So what does working at a funeral home entail? Collins, Herendeen and Tansley do various tasks like gardening and cleaning to keep the funeral home presentable, along with assisting families with their funeral needs. When they aren’t maintaining the funeral home and property, the Donahue funeral directors are helping families in the grieving process. The work can be emotionally taxing for the employees, but they don’t let it stop them from doing their jobs. At the end of the day, the funeral directors have to detach themselves from the situation. Funeral directors encounter a range of emotions when meeting with families, requiring a professional demeanor, a compassionate approach and sound judgment. In one situation they may try to calm someone down while in another, they may let someone grieve. Collins says sometimes he’ll try and comfort someone and tell them everything will be okay, but for the most part, the family steps in to comfort whoever is grieving. Dealing with grieving families isn’t the only challenging part of the job. When it comes to arranging a funeral, it is crucial that every detail adheres to the family’s wishes. Making every family feel like they are the only family being serviced when there are 10 other families being serviced can be challenging, Collins said. “Sometimes it could be the smallest thing that a family will find that will upset them, so you have to make sure that every little detail is met.” Herendeen said. Collins said you have to recall every detail about the arrangements. Donahue Funeral Home is a family-owned, independent business. This allows the funeral directors to form more of a relationship with their customers and to be more accommodating. “We’re family here,” Herendeen said. “There is no corporation here, there’s no one above us saying ‘you have to charge this family a certain amount and ‘you can’t give them any discounts,’ say if he family is in a financial hardship and they weren’t expecting this. A lot of families aren’t. Being independent also allows Donahue to host fundraisers, such as the haunted house the business hosted last year on behalf of the Lodi Chamber of Commerce, an event that drew more than 1,200 people to the funeral home in less than three hours. Donahue Funeral Home has been a part of the community for over 100 years and hopes to serve Lodi’s citizens for years to come. “It’s kind of important to be able to help out your friends and your family and your family friends,” Tansley said. “We have a whole network of people that trust us and depend on us a lot, because we have to be trusted in our job and if you don’t feel that, you don’t get the service.